Media reports will have you know that this strange animal of "unknown origins" has been "puzzling" scientists, but while it certainly looks the part, it's actually a critter we know well. You're looking at a cluster of Megabalanus californicus, the California barnacle. The cluster was pulled up by fisherman Mathew Wallace while crab netting recently off California's Port Hueneme pier. Having seen M. californicus before, we reached out to local marine biologist Alex Warneke, who confirmed the ID after a quick look. 1. The creature's colours are so unusual, it likely floated to California "from a tropical location". The California barnacle is actually known for its bright hues, and Warneke explains that those distinctive colours help us to identify it. The only other local species with a similar look is the pink barnacle (Tetraclita) – but M. californicus is by far the most flamboyant, she adds. 2. Openings in the creature's shell reveal "organs similar to mussels" which appear to have "teeth [that] shoot out from behind rainbow-coloured flaps". Rainbow-coloured flaps? Check. Toothy organs? Not so much. The hairy appendages you see reaching to and fro in the video are actually the animals' legs! 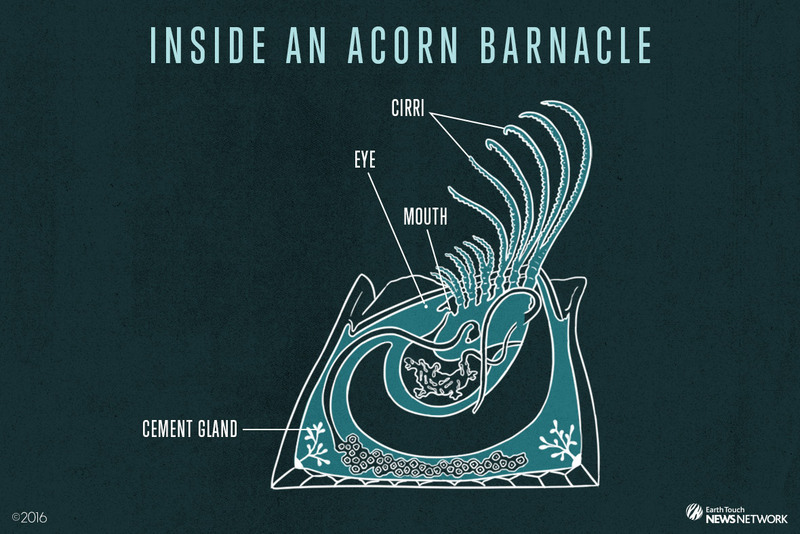 To make sense of this, we need to look at the barnacle family tree. Barnacles are actually small crustaceans, and although they don't look much like their cousins (the crab and the lobster), they do begin life as current-surfing larvae, just like all marine crustaceans. When a barnacle larva is ready to settle down, it attaches itself, head-first, using a special glue secreted from a gland near the head. This substance is so strong that back in the 1970s, researchers looked at its adhesive properties during the development of dental cement. Over time, the barnacle will produce a protective home for itself, made up of ten calcium-rich plates. It's a simple build: six plates form the "acorn" or "volcano" (yes, this animal has a volcano lair), and four plates form the door. 3. "The skin is slippery and spiky, with six massive openings." As already mentioned, Wallace did not find a multi-headed beast. Instead, the clip simply features a cluster of six barnacles. As for the slimy texture, Warneke explains this has to do with "encrusting sludge". "M. californicus is very distinctly white and pink," she says, adding that the algae and various other squatters that coat the barnacles' exterior could be what caused some confusion with the species ID.